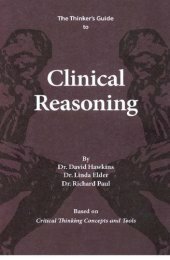 Clinical Reasoning- Introduces the clinician or clinical student to the foundations of critical thinking (primarily focusing on the analysis and assessment of thought), and offers examples of their application to the field. and providing patient education and counseling. given the signs, symptoms, and test results of a patient. works of prominent thinkers in the clinical fields.